Many psychologists agree that one-on-one therapy is an effective tool to address emotional and mental problems. However, group therapy promotes the idea that people with addiction are "in it together." It gives them a strong peer support network so that they don't have to fight addiction alone. Since group counseling is one of the most effective options, many addiction treatment programs use it. Along with the addiction itself, this approach can address anxiety, depression and poor confidence. It provides a safe place where people can share their thoughts, feelings and experiences with peers who have similar struggles. They also learn and grow from what their peers share. Therapists generally lead group counseling sessions in rehab. However, some groups eventually allow the patients to take the lead. The objective is to address the specific needs of each person through group support. Some examples include improving self-worth, managing stress and understanding relationships. Those who are in group counseling help each other stop using drugs and stay sober. There are several ways in which this treatment technique is beneficial. Preventing further isolation is the first and most important benefit for those who suffer from addiction. They often feel cut off from others and lonely. Not sharing their feelings about this illness with loved ones can make them feel totally isolated, which is a reason for continued drug use. Having a group of peers in recovery allows them to make like-minded friends. This mutual support gives them access to motivation, inspiration and strength when temptations arise. Group therapy also allows you to learn from others in recovery. Group members share effective strategies for staying sofer. Those listening can try these strategies to see if they help in similar situations. Although not all of these strategies benefit everyone, many of them will. Having others to talk to about their problems is also important. People with addiction often don't have a way to let out their frustrations or talk through bad situations. 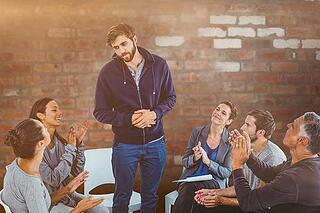 Among peers in a group setting, they can speak freely without judgment. Voicing what's on their minds can help them find solutions to their problems. While attending group sessions, members learn that they're stronger together. They also hold each other accountable for missteps. When peers are on the verge of relapse, they can rely on each other for support. Sometimes, myths about group counseling overshadow these benefits. Some people are afraid that participating means that they have to disclose their deepest secrets. However, you can only share what you feel like sharing. For instance, you might be more comfortable talking about personal feelings in one-on-one therapy. Others worry about group counselors putting them on the spot. Although the group members will want to know a little about each other, they don't force out the information. New members can take time to adjust to the setting before they share details about themselves. Anxiety is common when meeting new people, and meeting several at the same time could cause distress. However, there's no need to jump into group counseling right away. Many rehab centers use one-on-one therapy to prepare people to join groups. Compared to the four to eight hours of individual therapy that other rehab centers provide, The Clearing offers an intensive, 120-hour curriculum. The Clearing is also different from other treatment programs because we work with a stable group of 10 throughout the entire session. Once we assemble a group, the session is locked; no one will enter your program after the session begins. This means we have the ability to present a cohesive program, a 28-day progressive curriculum, each day building upon the days before. This approach is powerful as each person is learning, growing and applying the same information at the same time. The group establishes trust, confidence and friendship and becomes a powerhouse of focused, motivated individuals working together with the common purpose of learning and healing at an accelerated pace. Other programs have a "revolving" door of participants, randomly arriving and departing throughout your 28-day session, often on a daily basis. Using various counseling strategies and experiential activities, we focus on spiritual, mental, physical and emotional well-being to address the underlying cause of addiction.